The spin Hall angle (SHA) is a measure of the efficiency with which a transverse spin current is generated from a charge current by the spin-orbit coupling and disorder in the spin Hall effect (SHE). In a study of the SHE for a Pt|Py (Py=Ni80Fe20) bilayer using a first-principles scattering approach, we find a SHA that increases monotonically with temperature and is proportional to the resistivity for bulk Pt. By decomposing the room temperature SHE and inverse SHE currents into bulk and interface terms, we discover a giant interface SHA that dominates the total inverse SHE current with potentially major consequences for applications . To study bulk Pt, we set up a scattering geometry consisting of two crystalline semi-infinite Pt leads sandwiching a scattering region of length LPt of disordered Pt with atoms displaced from their equilibrium positions by populating phonon modes, as sketched in Fig.1a. For the resistivity and spin-flip diffusion length, this approach has been shown to yield essentially perfect agreement with experiment . We study the SHE by calculating local longitudinal and transverse charge and spin current densities in the scattering region so that both intrinsic and extrinsic contributions are naturally included. To study interface effects, we model a Py|Pt bilayer by matching 9×9 interface unit cells of Py to 3Ö7×3Ö7 unit cells of Pt  including both lattice and spin disorder in Py. Fig.1b shows the results obtained for bulk Pt at room temperature. This presentation will introduce and review the computational procedures that make these calculations possible . Figure 1: (a) Schematic illustration of the scattering geometry. Electrons flow from the perfectly crystalline left lead to the right one through a disordered region of pure bulk Pt where atoms are displaced from their equilibrium positions by populating phonons. Transverse spin currents arising from the SHE flowing along x and –y directions are polarized in the y (and ( directions, respectively. (b) Calculated transverse spin-current densities in Pt normalized by at room temperature. The error bars are a measure of the spread of 10 random configurations of disorder. The dashed black line shows the extracted SHA. 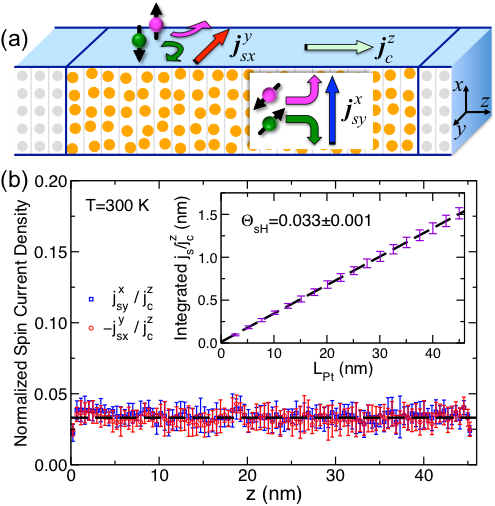 Inset: integrated spin current density in a length LPt of disordered Pt. The dashed black line illustrates a linear least squares fit from which a SHA for pure bulk Pt of is extracted.